Easy in. Easy out. We stepped from our condo, crossed the street, slapped on our skis, rode a short poma lift, and skied down to the complex of chairlifts rising from Big Skys base. From there we took our choice of chairs up to Lone or Andesite mountains. After a morning of skiing, we would swoosh to the European-style base village for lunch. Or if a homemade sandwich was preferred, we would make a quick trip down to our temporary home. The end of the ski day was even better. We practically skied into the garage. Big is the operative word at Montana's Big Sky Resort. The area features towering Mattterhorn-like peaks. It has a hundred named runs, many of them as wide as a football field, covering a distance of 85 miles. A staggering 18 lifts, including a European-style tram, a quad gondola and three high speed quads, can move up to 20,000 skiers and snowboarders an hour. On the mountain there's plenty of room to move. There's no dilly-dallying in lines, no bumper-to-bumper mobbed runs, even on busy weekends and holidays. Big Sky is a place to play, and play hard. It's been honored for its terrain, challenging runs, lifts and scenery. Nearly half the runs are rated intermediate while 43 percent are advanced/expert. That leaves 10 percent as beginner, but on such an expanse thats enough for most skiers. All levels of snow riders can find something to their liking. Beginners will find wide and expansive runs, while intermediates can choose between cruiser runs groomed as smooth as a baby's rear-end to all levels of bumps. But Big Sky especially caters to high-end skiers and boarders because of its array of testosterone-charging steeps, chutes and couloirs. 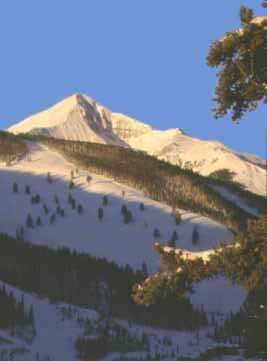 Big Sky's big reputation largely builds from Lone Mountain, which is accessed by a tram that shuttles only 15 people at a time. It's the only place where visitors will see a line. 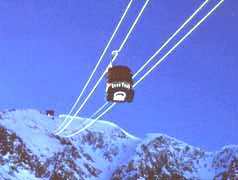 That's partly because the tram provides a lift and descent for people wanting nothing more than a look from the 11,500-foot peak. Sunny day panoramas include the Tetons of Wyoming. For those willing to give it a go, the summit offers a series of black and double black diamond runs. The least difficult route is on ungroomed Liberty bowl, which wriggles down Lone Mountain's south face before dropping into runs accessed by the Shedhorn double chair. The gut-check runs off Lone Mountain include Big Couloir, which plummets elevator-style down 2,800 steeply vertical feet. Even more challenging are runs from the appropriately named Challenger chair. 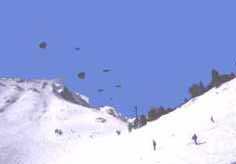 Long steep pitches drop through bowls and tree-lined chutes. A good place to prepare for Lone Mountain's summit runs is The Bowl, an ungroomed region of large and moderately-sized bumps. Located underneath the tram, The Bowl offers create-your-own-degree-of-difficulty runs. Much of Big Sky's appeal stems from its variety. Well-manicured cruiser runs include Elk Park Ridge and Big Horn, while Mad Wolf offers bumpy glades and moguls. It's easy to switch back and forth from knee-knocking moguls to groomed trails in a single run, a real plus when burned-out legs feel like Jello by late afternoon. Popular with beginners and those looking to advance their skills are runs off the Ramcharger high speed quad and Swift Current Express. Choices include the gentle slopes of Pacifier and Mr. K or the more testy Hangman's, Ambush and Tippy's Tumble. Downhill skiing and boarding are the major draws at Big Sky, but backcountry skiing is available on the neighboring Gallatin National Forest, while just down the mountain is the Lone Mountain Ranch with 65 kilometers of groomed cross-country trails. 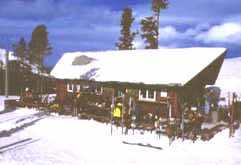 And, with Yellowstone National Park only an hour's drive away, the Nordic skiing, and sightseeing, possibilities are endless. It's worth planning an extended stay at Big Sky, even though it's only a 45-minute drive to Bozeman. New this winter is The Summit at Big Sky, a $45 million luxury hotel-condominium complex that's less than 300 feet from a trio of high-capacity lifts. A "soft opening" is being done this winter and a grand opening is scheduled in June. Also new this season is the Lone Moose triple chairlift, which allows people staying in the new Lone Moose Meadows condos to access Big Sky from their front doors. The lift increases the area's total vertical feet of skiing to 4,350, and offers a trio of new intermediate and advanced runs with connecting lifts to Big Horn and Little Ewe on Andesite Mountain. We felt pretty special as we skied in and out from our condo near the base village. But we weren't the only ones enjoying the luxury. 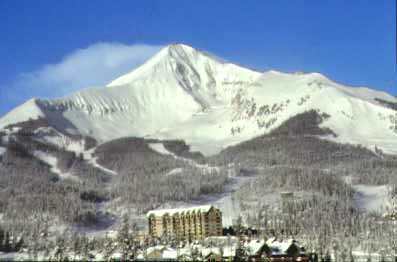 With over 1,000 lodging units for groups of all sizes, Big Sky offers about 2,000 ski-in, ski-out beds. Few places do it "bedder." Click here for details to plan your own trip to Big Sky, Montana.